When Dan Robbins passed away last week at the age of 93, many people paused to remember a man who made painting fun for the masses. 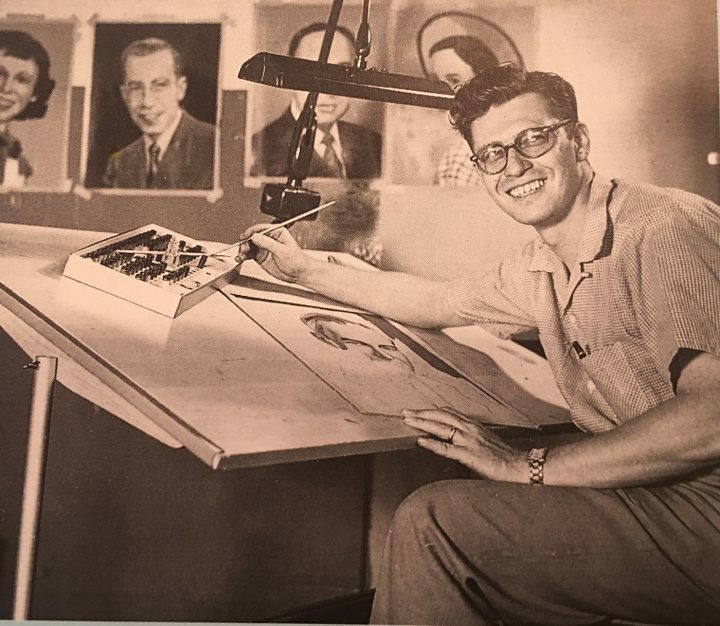 Robbins’s paint-by-number kits, which were conceived as a way to promote Palmer Paint Co. paint sets to a wider audience, were developed in conjunction with the company’s owner, Max Klein, and went on sell millions. Robbins was tasked with finding a way to market the paint kits to adults and found inspiration for his blockbuster invention in an odd factoid about the work of Leonardo da Vinci. “I remembered hearing that Leonardo used numbered background patterns for his students and apprentices, and I decided to try something like that,” Robbins said, during a 2004 gallery talk at Intuit in Chicago. According to Sarah Robbins, the process always started with the picture itself. “They hired artists,” she said, “and in fact, they hired someone pretty early on who was a much more accomplished fine artist — and they would first sit down and paint a picture that they wanted to see.” Once the composition was established, they would paint a version of the picture using those paints, and then lay a transparency atop the painting, to generate the shapes that would dictate the color fields to be filled in by users. 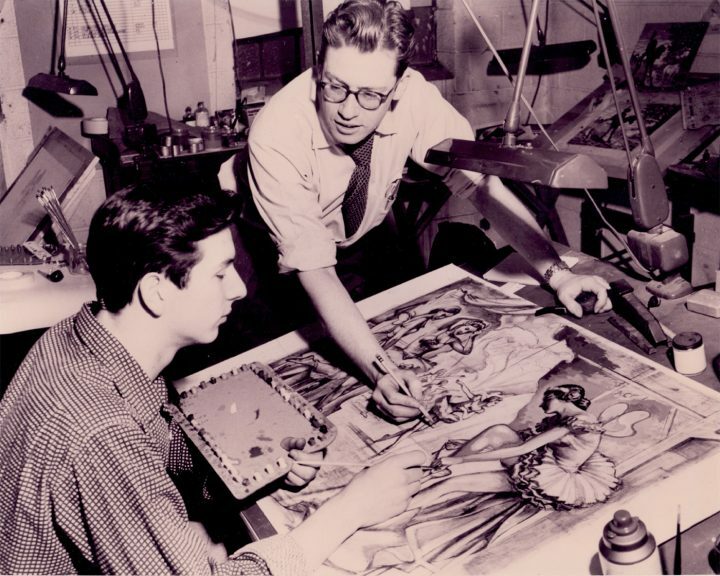 Dan Robbins (top) pictured with his first hire, Adam Grant, who was also a well-respected figure painter. There was an early-2000s resurgence of interest in paint-by-number paintings, following the death of Max Klein in 1993, after which his daughter, Jacquelyn Schiffman, donated the Palmer Paint Co. archives to the Smithsonian Museum of American History. The Smithsonian Institution’s National Museum of American History presented a paint-by-number exhibition in 2001, shifting critical conception of the painting fad from déclassé kitsch to a legitimately interesting and eminently collectible form of popular Americana. In step with the exhibition, Robbins authored a book, Whatever Happened to Paint-By-Numbers? : A Humorous Personal Account of What it Took to Make Anyone an ‘Artist’, but it was clear that he had a humble and balanced view of the artistic importance of his best-known invention. As reported by BBC News, Robbins was asked in 2013 if paint-by-numbers counted as art, and his response was unambiguous. “No, it’s only the experience of picking up a brush,” he is quoted as saying. The aim, he added, was to recreate what a real artist goes through. But many a “real artist” never lived to see his work so highly regarded by public and institutions alike, let alone distributed and proudly displayed in millions of US households. At its peak, in 1955, the Palmer Paint Co. sold some 20 million paint-by-number kits — which included a pre-printed canvas and numbered paint sets, enabling users to apply their own touches to images featuring landscapes, horses, and kittens, among other popular subjects. By 1957, the market became saturated with imitators looking to get in on the trend, and the market went bust in the 1960s, but not before Robbins’s colorful and approachable creations became a ubiquitous part of the hobbyist art landscape. Sarah Robbins is quick to affirm humility as one of her grandfather’s predominant qualities, whether in terms of his own art or his life.